I would like to express my deepest condolence to the families of Mr. Bae Hyung-kyu and Mr. Shim Sung-min and those who are still under the captivity of Taliban, back in Afghanistan. I understand the difficulties, uncertainties and worries that they are facing at the moment and very upset with what had happened. The incident should not happen at all if the Taliban followed the true and real teaching of Islam. Kidnapping, killing and tortures definitely are not part of Islamic teachings. As a humanitarian worker that had been in Afghanistan, I understand the situation that your brave Koreans are facing at the moment. I pray to ALlah that everyone that still alive shall stay alive and be safe back to Korea. GHAZNI, Afghanistan – Police discovered the body of a second South Korean hostage slain by the Taliban in central Afghanistan while the group threatened Tuesday to kill more hostages if their demands were not met by Wednesday, the latest of several deadlines. 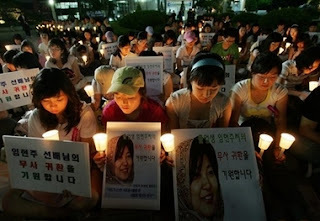 South Korea, meanwhile, pleaded with the international community to set aside the normal practice of refusing to cave into hostage-takers’ demands, as it urged a peaceful resolution to a standoff. Twenty-one South Koreans remain captive. The comments came after Afghan officials found the body of Shim Sung-min, 29, a former information technology worker who was volunteering with the South Korean church group on an aid mission to Afghanistan. He was killed Monday after two deadlines given by the Taliban demanding the release of insurgent prisoners passed with no action. Last week the church group’s leader, Pastor Bae Hyung-kyu, was fatally shot in unclear circumstances. A purported Taliban spokesman, Qari Yousef Ahmadi, said senior Taliban leaders decided to kill Shim because the government had not met Taliban demands to trade prisoners for the Christian volunteers, who were in their 13th day of captivity Tuesday. “The Kabul and Korean governments are lying and cheating. They did not meet their promise of releasing Taliban prisoners,” Ahmadi, who claims to speak for the Taliban, said by phone from an undisclosed location. The Taliban commanders set a new deadline of noon on Wednesday. The body was found on the side of the road at daybreak Tuesday in the village of Arizo Kalley in Andar District, about 5 miles west of Ghazni city, said Abdul Rahim Deciwal, the chief administrator in the area. An Associated Press reporter at the scene said the man appeared to have a gunshot wound to the right temple. Shim, who had recently left his job to prepare for graduate school, had previously visited the Philippines for five days as a volunteer worker and also had served as an army officer. “I think they act like they are not human beings,” he said. The Al-Jazeera television network, meanwhile, showed shaky footage of what it said were several South Korean hostages. It did not say how it obtained the video. The authenticity of the video could not immediately be verified. The Taliban kidnapped the 23 South Koreans, who were riding on a bus through Ghazni province on the Kabul-Kandahar highway on July 19, the largest group of foreign hostages taken in Afghanistan since the 2001 U.S.-led invasion. Seoul noted it did not have the power to comply with the Taliban demands “because it doesn’t have any effective means to influence decisions of the Afghan government.” It’s not clear if the Afghan government would consider releasing any militant prisoners, a key Taliban demand.